Ottawa has announced a $29.8 million grant for a new project that aims to harness the immense power of the Bay of Fundy's tides. Ottawa has announced a $29.8 million grant for a new project intended to harness the immense power of the Bay of Fundy's tides. Natural Resources Minister Amarjeet Sohi announced the grant in support of a $117-million project operated by Halagonia Tidal Energy Ltd. on Thursday, amidst a meeting of G7 ministers that has emphasized the importance of renewable energies. Simon De Pietro, director of Irish-based DP Energy, said its Halagonia subsidiary would produce enough energy to power 2,500 homes using a tidal power generation unit tested in the bay. He said the nine megawatt system could combine both floating and submerged turbines to work together, improving efficiency. The project comes amid the uncertain future of the marquee Cape Sharp Tidal venture. De Pietro said in an interview that his firm is aware of the challenges of operating in a bay with the world's highest tides. "Indeed the Bay of Fundy has already demonstrated its ability to challenge. We do not take that challenge lightly," he said during the announcement. "We don't want to rush in, drop it in the water, and for it to break." A news release from the federal government said Halagonia's project "will also demonstrate the potential for further tidal energy projects and provide valuable experience managing electricity generation from tidal resources." The funding is drawn from a larger pool of funds Natural Resources Canada has set aside for its emerging renewable power program. An Irish technical team has been working to determine why the rotor on the Cape Sharp Tidal turbine in the Bay of Fundy is not turning. Halifax-based Emera Inc., which was involved in the troubled project, said this week that experts believe a component failure in the generator "caused sufficient damage to prevent the rotor from turning." It says the turbine worked after it was after deployed in July and that it's not yet clear when the malfunction happened. Emera remains a shareholder in Cape Sharp Tidal, but recently announced it was pulling out of the project after co-owner OpenHydro filed for bankruptcy protection. The turbine will remain stationary while the OpenHydro team analyzes information gathered from sensors to determine whether it is functional. De Pietro said Thursday the goal is to have the Halagonia project in the water by 2020. The engineer and businessman said his privately owned company is attempting to help launch a new industry, and this is why his project needed government aid. De Pietro said the company is testing two technologies for the turbines and will judge which works best for delivering reasonably priced green energy. Sohi also said it's important to remember that in the early days of solar and wind power, public money was needed. Meanwhile, the provincial Department of Energy and Mines has issued a marine renewable energy permit to Black Rock Tidal Power, allowing it to test a 280-kilowatt floating platform for up to six months. The floating platform was installed Tuesday in Grand Passage, between Long Island and Brier Island in Digby County, Black Rock said Thursday. The permit will allow the Halifax-based company to learn how its device operates in a marine environment and "take a staged approach to deployment." Energy and Mines Minister Derek Mombourquette said in a news release Wednesday that supporting a marine renewable energy project like Black Rock Tidal Power's is a key pillar of the government's energy plan. 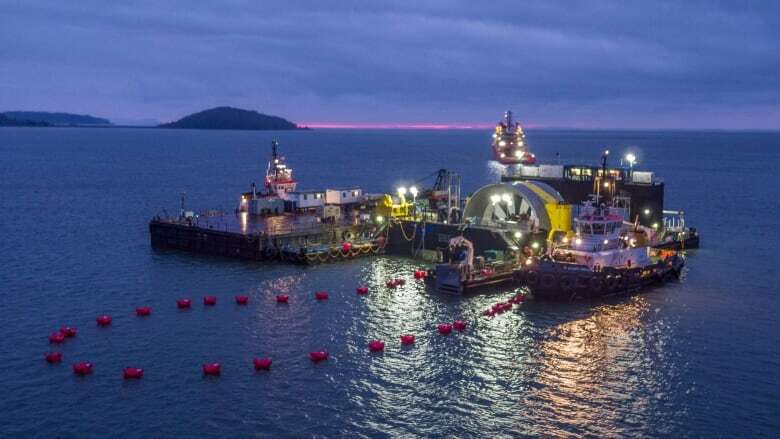 "Projects like this that test technology in the Bay of Fundy's unique marine environment will help spur innovation and competition and help solidify Nova Scotia's position as a leader in the development of tidal technology," he said.